silence option and durable bronze bushings. In addition, a polished brass lyre pendulum swings by a beat plate. Adorn your home in charm and tradition with help from this memorable wall clock. 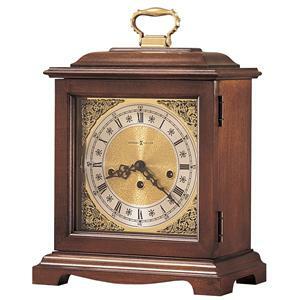 The 612 Jennison Wall Clock by Howard Miller at Wayside Furniture in the Akron, Cleveland, Canton, Medina, Youngstown, Ohio area. Product availability may vary. Contact us for the most current availability on this product. Pendulum Description Polished brass lyre pendulum swings by a beat plate. Chime Description Triple-chime movement with chime silence option. Wood & Finish Vintage mahogany finish with highly polished Viennese dial overlaid as well as individual convex chapter rings and center disc with an enameled finish. Case Detail Individually carved, scalloped shell on the pediment.